During the last 20 years, parents and teachers have passed along the secret of the Kissing Hand to children facing first days of kindergarten, first grade, and other separations. Now younger children can get in on Mama Raccoon's secret and find comfort in "A Kissing Hand for Chester Raccoon," a board-book adaptation of the original picture book. Chester could feel his mother's kissLeap straight into his heart. "With a Kissing Hand," said Chester's mom, "We'll never be apart." "Just press your hand upon your cheekAnd feel that loving glow.It's Mommy saying, 'I love you, 'Wherever you may go." "The Kissing Hand" has become a children's classic that has touched the lives of millions of children and their parents. 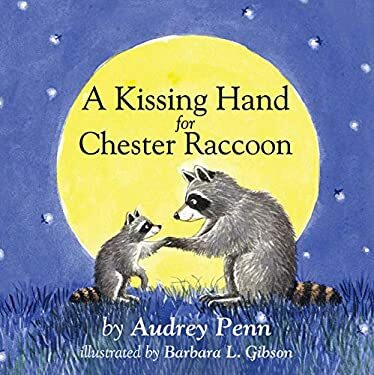 "A Kissing Hand for Chester Raccoon" conveys the heart of the story in rhyming verse, perfect for read-aloud and easy for even the little ones to remember and recite. With illustrations by Barbara Gibson that capture the warmth and beauty of the original artwork, toddlers now share in the benefits from Mrs. Raccoon's secret for making a child feel safe and secure. New (815 available) BRAND NEW. Over 1.5 million happy customers. 100% money-back guarantee. Make your purchase count: support Better World Books' worldwide literacy partners.